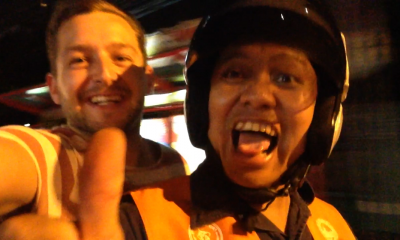 Traveltip: Let me help your with the taxi’s in Chiang Mai. You can choose red trucks (red songthaews) or a tuk tuk. When you want to go fast to your place take a tuk tuk. (they often ask 200 baht like 5 euro / 5.5 dollar) Do you have time save 90% and take a shared red truck. Traveling with a group? Don’t miss the tip about the cheap rides you can make by GRAB. The red trucks are shared taxi’s. They drive around and everybody can ask the driver to bring them somewhere. The driver makes his route on the destinations of the clients. So it can happen that the driver pick you up first and takes more people along the road but they reached their destination earlier. If your destination doesn’t fit in the route of the red truck the driver can also say no. No worry there are plenty of red trucks in Chiang Mai! Little explanation first the old city ring of Chiang Mai has two roads. 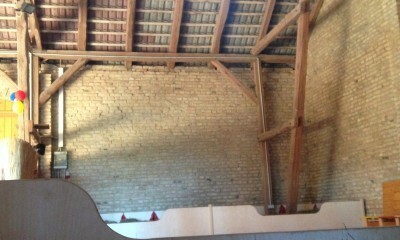 The outside and the inside. They go to the opposite way. The best thing you can do is check your (offline) map and check where to go. Cross the street so the red trucks that are coming are already going the right direction. Always stand on the left side of the street so the driver can easy stop at your place. When a red truck shows up, just raise your hand and wave a bit to the driver. Best strategy for the best price. The driver will open his window. Never start like this: how much to go to? Its time for your pokerface. Just say the name of your destination and the driver will say yes or no or he don’t understand you. The offline map can be worth to show the driver the place you want to go. When the driver says yes you will jump in the back of the truck. When you’re at your destination you will pay the driver. When the driver passes your destination (doesn’t happen often, almost never) you can push the stop button on the ceiling of the truck. See picture below. What does the red truck costs? Normal always 30 baht, you can also see that on the side of the red truck. That is 0.80 euro of 0.90 dollar! 🙂 But sometimes the driver will say 40/50 or 60 depends on how far is it. You can try different red trucks first. But sometimes you won’t find one for 30 baht. Than you still can negotiate about the price. See more: How to bargain tips. When you’re with a group you might better download the app GRAB. 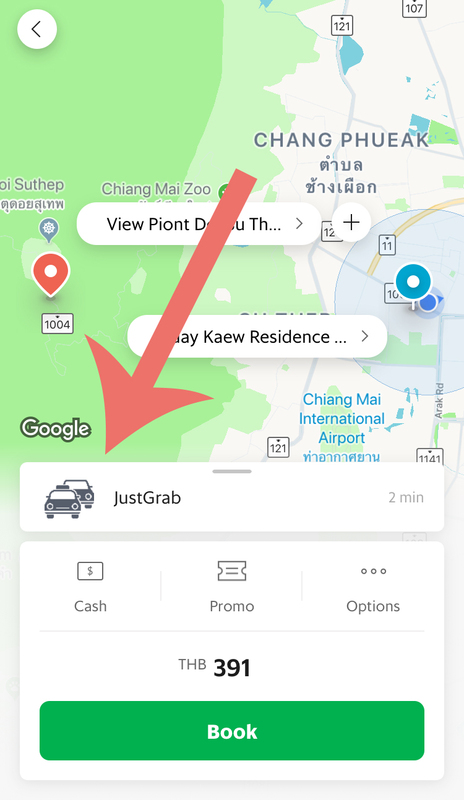 (Click here to get 100 baht off GRAB) This is like Uber here in Thailand. You can also order a Red Truck with your grab! See forexample the image below. A ride to the viewpoint at Doi Suthep 🙂 You can see for a normal ride will costs minimal 391 baht. (max 4 persons = 98 baht pp) but a full Red Truck will be 300 baht for 8 persons. 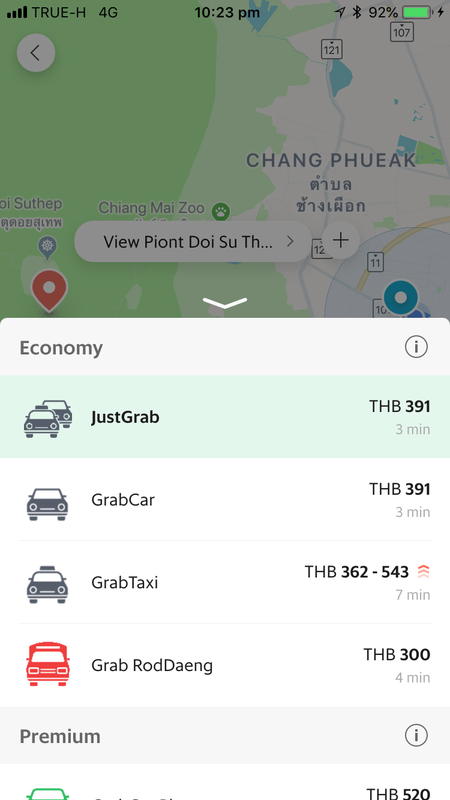 (38 baht per person) Normally when you’ve to order a second grab for the fifth person you pay 391 baht x 2 = 782 baht. 782 baht / 5 = 157 baht per person. 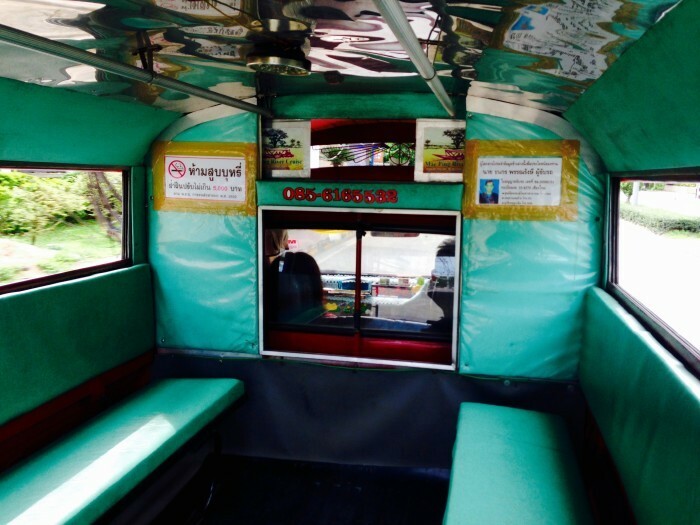 This way you save almost 130 baht per person on a ride to Doi Suthep, or 482 baht as a family <3 You don’t need a credit card you can also just register and pay with cash. 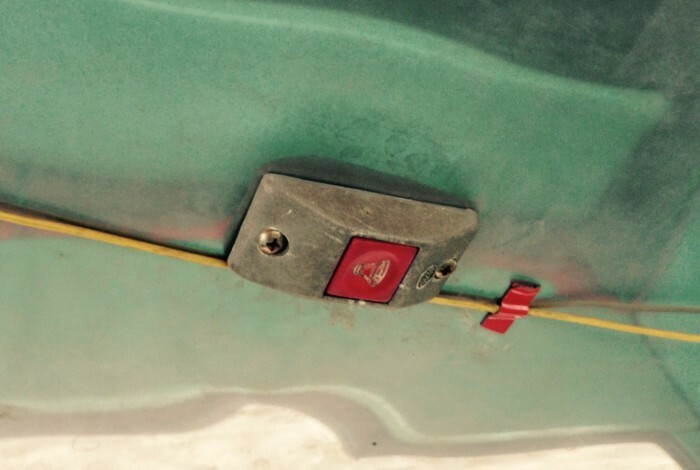 Step 1 – Image 1: Click on the JustGrab icon. Step 2 – Image 2: Select Grab RodDeang with the red icon. See more of Chiang Mai? Choose the different colored trucks. This are fixed route songthaews and congregate around Warorot Market. From Warorot Market, white songthaews travel to the eastern suburban city of Sankampaeng, yellow songthaews travel to Mae Rim in the north, blue songthaews travel to Sarapee and Lamphun in the south, and green songthaews travel to Mae Jo in the northeast. They all charge a 30 baht flat rate. 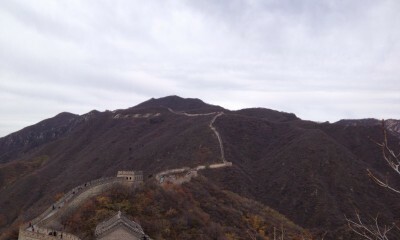 Beijing to the Great wall! Just moved to Chiang Mai and have been worried about how to red trucks work! Thank you!! Hope this article helped you Lauren 🙂 How is Chiang Mai for you?